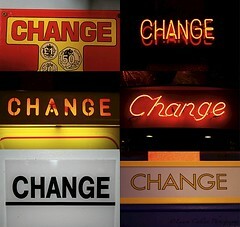 One of the more popular buzzwords of this campaign cycle is “change”. No doubt the various consultants for each candidate has determined that Americans are desperate for change, given the rock-bottom approval ratings of the current POTUS. To cause to turn or pass from one state to another; to alter, or make different; to vary in external form, or in essence; as, to change the color or shape of a thing; to change the countenance; to change the heart or life. Under this definition, change would have to be a fundamental alteration of practice or policy. Do any of the candidates promising such action actually endorse policies that would result in true change? We’ve not made progress if change gets us to a world where lobbyists influence Democrats rather than Republicans. It’s not “change” if we get back to a world where the Lincoln Bedroom goes to a leading Democratic fundraiser rather than a Republican. If the only “change” at stake here is a change in the party in control, then there’s no much to get excited about. We’ve been promised change in the past. Contrarian politicians seeking to promote their party platform promise a change from the “status quo” and reform once in office. Have any followed through? The rallying cry of change is, far too often, nothing more than feel-goodery designed to play on people’s emotions. We’re fed up with a broken economy, a botched foreign policy, a maverick leader, and all sorts of other political blunders being committed by the previously self-proclaimed “agents of change”. And so, given America’s horrible recollection of broken promises, current candidates capitalize on the same promise of a new way, often leaving out the specifics on just what they would change, and why it would really make a difference. Does spending more money change things? Does a new cabinet bring change? Or a few tax cuts? Like it or not, we haven’t had much of a change at all for several decades. What a party opposes one year, it may endorse the next. Leaders may come and go, but the policies and programs needing change barrel onwards, free from major interference. True change requires major action. Simple alterations in procedures, or simply slowing down the gradual degrade into imperialism and bankruptcy, will not produce the necessary change to ensure our Constitution and its protections remain in force. Giving lip service to change while supporting policies that either continue or expand the very thing Americans want to change is straight out of the aspiring politician’s manual. Are we so naÃ¯ve that we think it will be different this time? Some believe that that is the definition of insanity: doing the same thing but expecting different results. Readers of this blog will no doubt be able to guess that my conclusion focuses on presidential candidate Ron Paul. The one candidate who can offer real change, with a voting record to prove it, is the one who refrains from capitalizing on the emotional component of the word to entice would-be voters. But make no mistake, his platform—a return to the Constitution—would, in our day and age, bring about quite a bit of change. That may sound like an easily dismissed statement in the world of politics, but the fact remains that change will not occur unless the people at large are living virtuous lives and demanding the same of their leaders. After all, those whom we elect speak volumes about the national character and what America really wants for its future. Change begins with you, not the would-be representatives seeking your vote. The irony that should give everyone pause: George W. Bush probably initiated more changes than any president since World War II. All for the worse! Other candidates nibble around the edges of the problems that beset America, but nibbling will just allow the problems to continue to grow. Alternatively, Ron Paul has actual solutions to the problems. He doesn’t nibble. Spiegel wrote up an article on this issue, pointing out the empty rhetoric of leading candidates.